Drill nights and training sessions are often concentrated around the basics of firefighting operations whether it involves stretching hand lines or setting up ground ladders. It is important to work on those kinds of skills however before training on a concentration of the trade it is important to work on the fundamentals. Air management and SCBA (Self Contained Breathing Apparatus) Mask Confidence are even more important to a firefighter’s skill set because they are at the foundation of interior operations that will require the basics such as search and rescue. If a firefighter is not comfortable wear his or her SCBA mask then he or she may not be able to complete various tasks while operating in smoke filled environments. Additionally if a person is able to wear their mask then they should be able to manage their breathing appropriately to conserve air in their SCBA as well as maintaining their emotional status. There are many possible exercises that can be conducted in order to work on these two important elements of firefighting. SCBA Mask Confidence begins with a member being comfortable to wear their mask without any issues. This can be done a few ways such as simply working with your members to wear their masks without any other variables. From there you can progressively work with them add components such blacking out their vision with their hoods or plastic wrap to simulate distorted vision. At this point you may want to consider working with your members to learn about how the mask rest on their faces and how it impacts their peripheral vision. By playing a simple game of soccer or basketball member will be able to experience how the mask impacts their normal vision. Once members are confident in wearing their SCBA masks, they will be able to work on their air management skills by using their complete SCBA. Once again it is a process that depends on the progressive training that build on prior tasks. It is important to give your members the opportunity to get used to being on air and aware of what the SCBA will do when engaged by breathing. At this point you can add playing dodge ball or basketball, as seen in many videos on facebook; in order to get each members’ individual awareness of their breathing patterns when taking part in an activity that attempts to simulate the experience the body goes through while executing firefighting tasks. By being aware of how much air a member uses he or she will be able to work on their tendencies in order to optimized their breathing and air management potential. Firefighters can use tactics such as skip breathing and breathing slower in order to use less air while using an SCBA. After members are comfortable wearing their masks and are aware of their breathing habits then the process build to working on Mask Confidence in simulated situations such as smoke filled environments and confined spaces. Whether its going through a confined space course navigating through various tight spaces or practicing swinging an axe on air as if he or she was operating on a roof during ventilation operations, it is important to bring together all of these elements to allow member the opportunity to strengthen their skills. If a firefighter hones his or her SCBA skills it will allow them to become a better asset that will be able to operate more efficiently in all aspects of firefighting. Start at the basics and allow your members to build on their training. Understand your limitations while wearing an SCBA. Be aware of your breathing habits. Pic 1: Some mask confidence courses include situations that simulate an entanglement hazard where a firefighter must navigate under all the wires while staying on air. 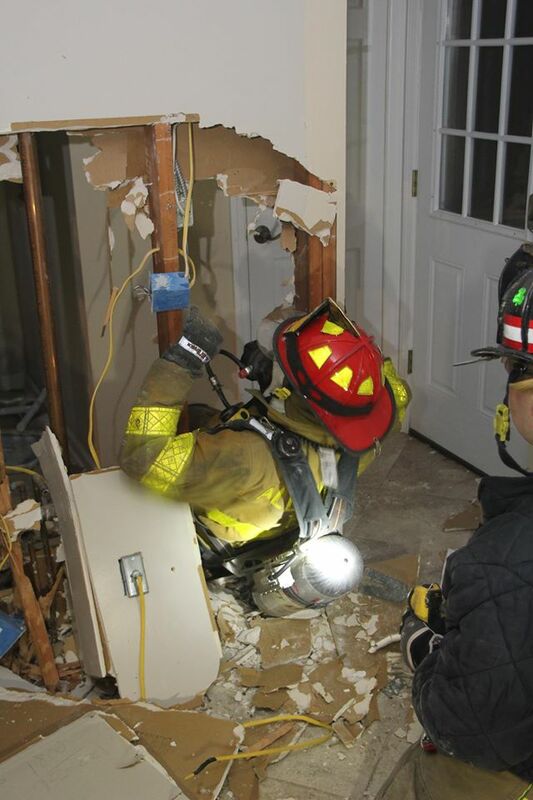 Pic 2: Be creative and use everything in your firehouse to create a mask confidence course such as using a ladder to create a confined space opening where a firefighter must stay on air and navigate through the rungs of the ladder. Pic 3: Members swing hand tools at a tire to simulate chopping with an axe or any other hand tool that may be used during operations. Pic 4: Training on breaching walls allows firefighters to work on their breathing when opening up a wall and making their way through it. It allows them to become aware of what their tendencies are as well maintaining their SCBAs.